The aim of this research is to point out the patterns of media use of an inmate before the incarceration and the communication habits, as well as the compulsorily restricted media use during imprisonment. The purpose is to get insight of how the prisoners deal with the change of their situation and the subsequent use of traditional media such as letters and phone calls in order to keep in touch with their family and other social contacts. Deriving from the media repertoire approach, the research question is focused on the media use before and during imprisonment, which should clarify the change of patterns. In order to conduct a detailed exploration of a media repertoire on the personal level, the data collection has been conducted through semi-structured in-depth interviews with female prisoners from the German female prison TAF (Teilanstalt für Frauen) at the JVA Billwerder. Digital change is an everyday challenge for individuals, but also for society. Every part of modern life is somehow connected online. Humanity relies heavily on contiguous technological improvements and digital success. Even addiction to the Internet has become a growing issue in society and research (Griffiths, 2016). In Germany 88% of the population has access to the Internet (Internet Live Stats, 2016). However, what about the part of society who is excluded from the Internet? What about prisoners whose media consumption is regulated by institutions and by the state? RQ1: How are the patterns of media use of an individual changing in the case of imprisonment? RQ2: How does the change of the media repertoire affect the social relationships of a female prisoner? Sub RQ: What role does the lack of social media play in the shift of the communicative figurations? Since the nature of the topic of this study poses some ethical considerations a basic premise must be outlined here. “Do offender perceptions really matter? Clearly, some would argue that they don’t, maintaining that it is for society rather than criminals to determine the purpose or meaning of punishment” (Van Voorhis, 1997, p. 139). 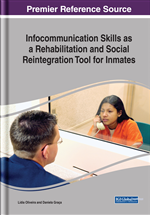 This study looks at the prisoner as an important individual which is part of our society, and therefore needs to be reintegrated after incarceration. This reintegration makes it relevant for the society who demands punishment, as well to give them a chance to regain respect and prove that they deserve a second chance. Therefore, offender perceptions matter as they help us to understand the situation from the point of view of a prisoner. The everyday, but also long term, needs of prisoners are taken seriously and therefore this study is interested in their perceptions in order to ascertain a better understanding for society at large, but also with regards to the rehabilitation process as a whole. Though this study does not examine the victims who may have suffered as a result of the prisoners‘ actions, they are not forgotten. This study does not intend to diminish the seriousness of the delinquency and the horror they may have lived through. Semi-Structured In-Depth Interviews: Interview technique where the researcher follows not a strict questionnaire but gives more freedom to the interviewee to decide what is important to point out for him/her. Media Repertoire: The whole range of media consumed by one individual. Traditional Media: Offline media such as letters, phone calls for a landline, in-cell TV, and face-to-face visits. Visualizing Cards: Method to visualize the media repertoire of an individual. JVA (Justizvollzugsanstalt): German term for a correctional institution. Female and male prisons are usually strictly separated. They can be closed or open institutions. SNS: Social networking sites such as Facebook, Twitter, Instagram, etc. Online platforms where the communication is interactive, and an individual can build a social community. Communicative Figurations: Media communication happening within a specific social (sometimes public) context.